There was an informative panel MC’ed by Laura Sharpe, founder and CEO of AFT, John Behzad, FACHE, CEO of CRI, Dr. Janina Urussowa, Founding Partner, Bezgraniz Couture, Dr. Mary Nasmyth, Co-Chief Medical Officer, CRI and Clinical Chief for Physical Medicine and Rehab at Cedars Sinai Hospital. "In this context, Artists For Trauma and California Rehabilitation Institute help facilitate transition to a more enjoyable life. We collectively help with renewing function and redefining lives. With this alignment in vision, it is my privilege to work with Laura Sharpe and her team of dedicated professionals. AFT orchestrated a wonderful event at CRI, and the event helped engage people to have a better understanding and appreciation for rebranding disability. Capitalizing on the healing power of arts, AFT softly touches the hearts and spirit of people in our community ," said John Behzad. 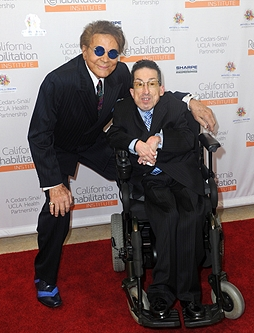 'Rebranding Disability' was a pre-event to the premiere of Bezgraniz Couture at LAFW and a successful launch and union between not only AFT and CRI, but also AFT and Bezgraniz Couture. "Following the AFT/CRI distinguished speaker panel featuring Dr. Janina Urussowa, there was an engaging Q & A with the attending VIP guests. Enjoyed by all was a special performance by Infinite Flow - a wheelchair dance company. The day's results were electric and the audience of medical professionals, business, entertainment, media and adaptive community leaders stimulated to engage in further conversation. The attending VIP community leaders clearly recognized the irrefutable value of evidence based, healing through art platforms on world issues of recovery and rehabilitation. Equally the group was inspired to discuss creating additional progressive, business ideas on how to leverage the day's platform on 'Rebranding Disability' for the 15%+ of the world's disabled population, " added Laura Sharpe. AFT was founded by philanthropist Laura T. Sharpe, who is a trauma survivor herself and selflessly wants to help other trauma survivors to be empowered, inspired and healed. 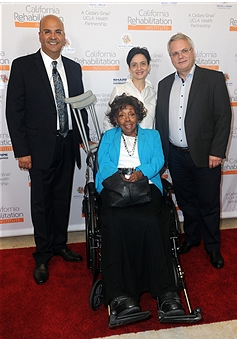 There were numerous celebrities and VIPs in attendance at this event such as Laura Sharpe, the founder of Artists for Trauma, John Behzad, CEO of California Rehabilitation Institute, Dr. Janina Urussowa, Founding Partner, Bezgraniz Couture, Dr. Mary Nasmyth, Co-Chief Medical Officer, CRI and Clinical Chief for Physical Medicine and Rehab at Cedars Sinai Hospital, celebrated actor Ford Austin (Bosch, Dahmer vs Gacy, Facebook Live with Ford and Vida), his wife, Emmy-winning producer Lauree Dash, actress and fashion blogger Vida Ghaffari (Jimmy Kimmel Live, The Mindy Project, Facebook Live with Ford and Vida, So Very Vida), actors Laurene Landon (Sky, Airplane 2, The Sequel), Mel Novak (Bruce Lee's Game of Death, Samurai Cop 2: Deadly Vengeance), Kate Linder (The Young and The Restless, Mother's Day), Ken Davitian (Borat, Ray Donovan), Rick Mora (Twilight, Band of Pirates: Blackbeard's Map), Johnny Whitaker (Family Affair, Sigmund and the Sea Monsters), Quinton Aaron (The Blind Side, Paranormal Movie), Ethan Rains (NCIS, NCIS: Los Angeles), Robert Wall ( Bruce Lee's Game of Death and Enter the Dragon), Kim Estes ( Pretty Little Liars, Fresh Off the Boat), Carolyn Hennesy (General Hospital, Ray Donovan), Robert Parham (Jackson Bolt, Assassin X and 5 time world Kickboxing Champion), Dawna Lee Heising (Samurai Cop 2: Deadly Vengeance, Bladerunner), Gabriel Jarret (Real Genius), Jon Mack (Saw VI, Blunt Force Trauma), EJ De La Pena (Nobility, Jingle All the Way), Zhubin Rahbar (The Masterpiece, Laleh), Michelle Bernard (Any Given Sunday, Grease Live! ), actress and model Miki Black (CSI: New York, Maxim, Benchwarmer), entertainment attorney Nadia Davari, Lousine Karibian, founder and CEO of the World Networks and as well as royalty such as HRH Mandana FarmanFarmaian, a philanthropist and producer and HRH Davood Roostaei, renowned artist and founder of Cryptorealism. AFT and CRI were the main sponsors for this event. Additional sponsors are Buiced, Coco Taps, Sharpe Interior Systems, Sur le Mur, Moby Arts, Bezgraniz Couture, and LA Fashion Week. "Live with Ford and Vida," which is co-hosted by celebrated actor Ford Austin and noted fashion blogger and actress Vida Ghaffari, is proud to be a media partner for this event. Austin is a trauma survivor as well as an Ambassador for Artists For Trauma and an inspiring success story. "I feel very blessed to have been embraced by Artists For Trauma and Laura Sharpe. We hope that with the support of AFT, we can shine a bright light of hope on the spirits of all trauma survivors and those overcoming PTSD," said Austin.